I was recently helping a client speed up her site, when I found she was using both Google Analytics and another statistics plugin. Using both means additional scripts have to be loaded on the page, which slows down a site. I recommend only using Google Analytics. When I asked her if she was actually using both, she said she installed the other plugin because she couldn’t figure out how to use Google Analytics. I’m sure she’s not the only one. Are you using something other than Google Analytics for your site stats? Or maybe using multiple plugins as well? Here’s everything you need to know to get started with Google Analytics so you can get rid of other plugins (and speed up your site at least a little bit!). And of course, actually understand your data so you can do something with it! If you haven’t yet set up Google Analytics, that’s the first thing you need to do. If you already have, you can skip this part. There are plenty of plugins to install Google Analytics on your site, but I recommend adding the tracking code with the Insert Headers & Footers plugin, and getting familiar with the actual Google Analytics Dashboard instead of seeing a small part of your statistics inside WordPress. Sign up for Google Analytics and set up a property. Go to the Admin area of Google Analytics. From the ACCOUNT and PROPERTY columns, select the property you’re working with. Click Tracking Info > Tracking Code. Copy the Tracking Code snippet. Install the Insert Headers and Footers plugin. 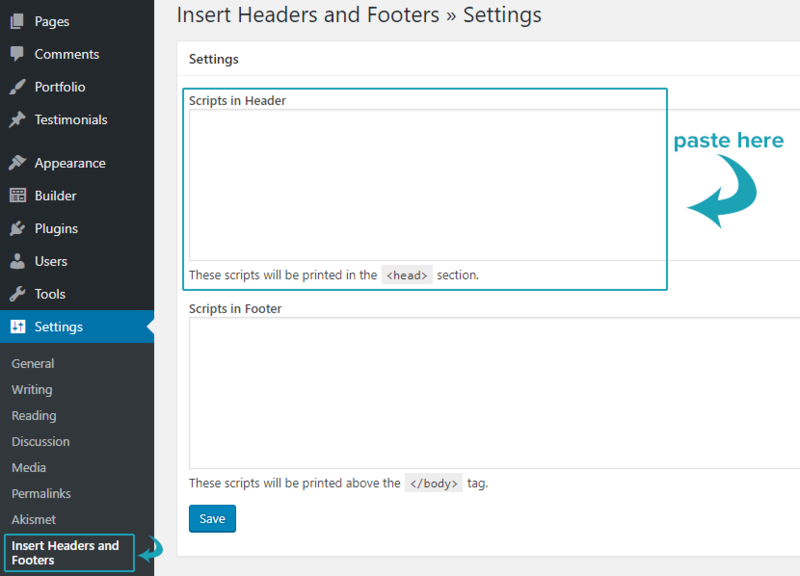 Go to Settings > Insert Headers and Footers and paste the snippet (without changing anything) into the Scripts in Header box. Click Save and check the Tracking Status in your property to see if it’s installed correctly. How often do you look at your own site? You really don’t want your own traffic to influence your statistics, so you need to set up a filter to keep your own traffic out of your stats. Go to What’s My IP. Copy the numbers at the top after ‘Your IP Address is’. Go to the Admin area of Google Analytics. From the ACCOUNT and PROPERTY columns, select the property you’re working with. In the VIEW column, click Filters. Click the button to create a new filter. Give it a name, ‘Exclude my own traffic’, or another name that makes sense to you. Under Filter Type, keep it at Predefined and select to Exclude traffic from the IP addresses that are equal to, paste your IP address in the IP address box, then save. You’ve now set up a filter to exclude your own traffic from your stats. If you travel or work in coffee shops a lot, you may want to instead install a WordPress plugin for Google Analytics that can exclude your traffic based on whether you’re logged in to WordPress or not. If there are just a few places you regularly visit your site from, you can also set up the filter for multiple IP addresses. You may also want to set up a filter to exclude analytics spam. You can find your most visited posts (and pages, Google Analytics doesn’t differentiate) under Behavior > Site Content > All Pages. As for the source of your traffic, you can find the social media channels under Acquisition > All Traffic > Channels. Click on Social to see a breakdown of the different social channels your visitors came from. To see keywords and phrases people used to find your site, go to Acquisition > All Traffic > Channels and click on Organic Search. Most will be “(not provided)”, but there might be some gems in here for you to use to optimize your content for search engines. On the first page of the Google Analytics Dashboard, it shows you a quick overview of the visits over the last 7 days. Users is the amount of unique visitors to your site, sessions includes recurring visitors. Don’t pay too much attention to bounce rate and session duration. Bounce rate shows how many people came into your site on one page and didn’t visit any other pages in that session. It doesn’t really tell you all that much. They might be subscribers already (so didn’t subscribe and get sent to a Thank You page). They might’ve spent 15 minutes extensively reading your blog post and got a lot of value from it, maybe even pinned it to Pinterest or shared it on other social media before they left. OR they might have spent 5 seconds looking at it, realise it’s not for them and leave. As for session duration, you also need to know that time on a page in Google Analytics is not that trustworthy. It can only track how long someone has been on a page, if they leave that page to visit another page on the same site. So if they go from Home to “Blog Post”, they can tell how long someone’s been on Home (from the time the visitor came on, to the time they went to Blog Post), but if the visitor then leaves the site, they can’t say how long that person has been on Blog Post and it shows as 0:00. So if someone came in at a blog post, read it for 15 minutes and left, it shows as 0:00 for session duration. Acquisition is about where visitors came from when they visit your site. On the dashboard, you see an overview split into Traffic Channel, Source/Medium and Referrals. It only shows the top sources in this overview. You can click through to Acquisition Report for the complete list of traffic sources. Organic search are the visitors that found your site through Google and other search engines. If you use Google AdWords or other advertising platforms you also see Paid Search as a separate channel. Referral means these visitors came to your site through a link on another site. Social is the traffic coming from places like Facebook and Twitter. Direct are visitors who directly entered your website URL into their browser’s address bar. Email comes from clicking a link in an email (obviously). Other is the catch-all for anything that for some reason could not be tracked as coming from any of the other sources. This shows the traffic split out by actual source. You can see how many visitors came from Google, Facebook, etc. It also shows which traffic channel each source is listed under (organic/social/referral/etc). Here you get an overview of the visitors that came to your site through a link on another site – and which sites they came from. On the GA Dashboard, you can also see on what day and what time of day you get the most visitors, what country they come from, what devices (desktop/tablet/mobile) they use and which pages are most visited. For every overview on the Dashboard, you can click through to the full report. For location, you can click through to the full list of countries your visitors come from. If you click one country in that report, you get to see it split up by region (e.g. by state if you click the U.S.), and can also see the amount of traffic per city etc. When you set up goals to track for your site, they are also shown on the Dashboard. Once you’ve set up Google Analytics, you can start getting strategic about your site. 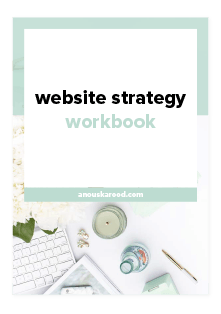 Sign up below for my free Website Strategy Workbook and use your site strategically for your business. Get your Website Strategy Workbook to improve your website and turn more visitors into clients. Fill in the fields below to grab the Website Strategy Workbook. It’s free! You get access to my Free Resource Library, including the Website Strategy Workbook and other resources to help you attract dream clients + make more sales.